My Thoughts: If you really love someone let them go where they want...!! If you really love someone let them go where they want...!! Recently I have finished reading a book "Eleven Minutes-- by Paulo Coelho " . Once upon a time , there was a bird.He was adorned with two perfect wings and with glossy, colorful, marvellous feathers.In short, he was a creature made to fly about freely in the sky , bringing joy to everyone who saw him. One day, a woman saw this bird and fell in love with him.She watched his flight, her mouth wide in amazement , her heart pounding , her eyes shining with excitement.She invited the bird to fly with her , and the two travelled across the sky in perfect harmony.She admired and venerated and celebrated that bird. But then she thought : He might want to visit far-off mountains! And she was afraid, afraid that she would never feel the same way about any other bird.And she felt envy,envy for the bird's ability to fly. And she thought : "I'm going to set a trap.The next time the bird appears, he will never leave again." 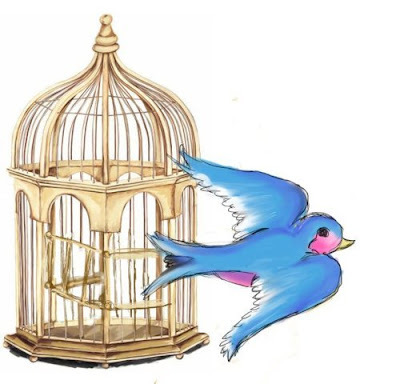 The bird, who was alone in love , returned the following day, fell into the trap and was put in a cage. She looked at the bird everyday.There he was, the object of her passion,and she showed him to her friends , who said :"Now you have everything you could possibly want". However a strange transformation began to take place: now that she had the bird and no longer needed to woo him, she began to lose interest.The bird , unable to fly and express the true meaning of his life, began to waste away and his feathers to lose their gloss, he grew ugly and the woman no longer paid him any attention, except by feeding him and cleaning out his cage. One day, the bird died.The woman felt terribly sad and spent all her time thinking about him.But she did not remember the cage, she thought only of the day when she had seen him for the first time, flying contentedly amongst the clouds. If she had more looked deeply into herself, she would have realised that what had thrilled her about the bird was his freedom, the energy of his wings in motion , not his physical body. Without the bird, her life too lost all meaning , and Death came knocking at her door . "Why have you come?" she asked Death. "So that you can fly once more with him across the sky, " Death replied. "If you had allowed him to come and go , you would have loved and admired him even more , alas , you now need me in order to find him again." be back.If they are not back then dont worry , God might have already set a Best one for you . Believe in god , he know where you will be happy.